Strong supporters of the political coalition that ousted Mahinda Rajapaksa expressed dismay about the Yahapalana Government during the popular TV show ‘Face the Nation’ telecast by MTV. Dr Paikiasothy Saravanamuttu, a strident voice in the anti-Rajapaksa camp who was the Secretary of the Consultation Task Force of Reconciliation Mechanisms (CTF) appointed by this government and Prof Rajiva Wijesinha, one of the first to break ranks with the Rajapaksa and support the candidacy of Maithripala Sirisena, were both highly critical of what the government has done and not done over the past two and a half years. 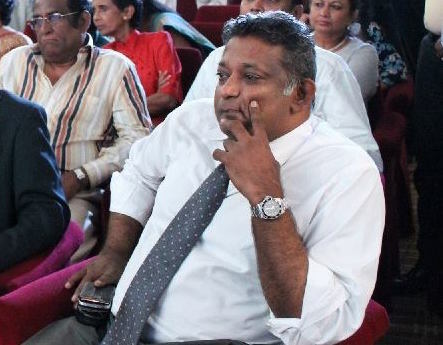 Dr Saravanamuttu said that the government has failed to live up to expectations. He said it was clear that the government was motivated by political expediency to postpone election. He added that having Provincial Councils that were not run by elected councillors gives a poor message to those who were hopeful that this government would move on greater devolution of power. Prof Wijesinha expressed the view that things started going wrong on the day that Maithripala Sirisena was sworn, claiming that Ranil Wickremesinghe and the United National Party have stood in the way of the President’s manifesto being implemented. Interestingly, the fourth panelist, Malinda Seneviratne, came to Dr Saravanamuttu’s defence when Prof Wijesinha questioned the integrity of ‘the sample’ of respondents whose testimonies were recorded by the CTF. Prof Wijesinha’s position on what constituted ‘conflict of interest‘ in the context of defending the former Central Bank Governor, Nivard Cabraal, was hotly disputed by another panelist, senior attorney-at-law Gomin Dayasri. Cricket Field & Political Field - Anguish Sparks Violence? Professor Rajeewa, soon after getting the higher education ministry in yahapalanay government, came with a FB post saying he is started to re-write the higher education Act. I felt such behavior just as a bus conductor who open the ticket book once passenger get in to a CTB bus..
Reforming the education reform is not some thing similar to grade 5 scholarship exam. If so called professor can come with the process (at least copy and past from some where) that would be a great thing. If I say politicians are politically corrupt and academics are academically corrupt and neither of them have anything to deliver will Rajeewa disagree that some of them falls in to both corrupt bucket as of every others politicians and academics in totality.